You'll be £8.99 closer to your next £10.00 credit when you purchase British Army of the Rhine. What's this? The nervous geopolitical tension between East and West, the Cold War, emerged before the end of the Second World War and lasted until 1991 with the collapse of the Soviet Union. 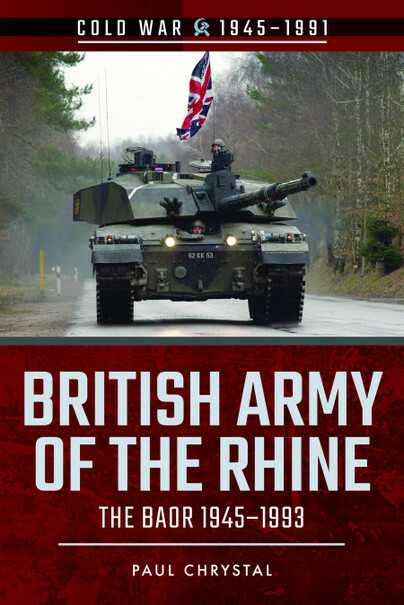 The British Army of the Rhine was born in 1945 out of the British Liberation Army at the close of the war as the military government of the British zone of occupied Germany. As the Soviet threat increased, so BAOR became less of an occupational army and assumed the role of defender of Western Europe, and as a major contributor to NATO after 1949. This book traces and examines the changing role of BAOR from 1945 to its demise in the 1993 Options for Change defence cuts. It looks at the part it played in the defence of West Germany, its effectiveness as a Cold War deterrent, the garrisons and capabilities, logistics and infrastructure, its arms and armour, the nuclear option and the lives of the thousands of families living on the front line. Paul Chrystal has provided a well-researched and east-to-read account of a major Allied commitment that has, for most of us, been bereft of detail for too long. A list of Abbreviations precedes the Introduction, there are eight pages of written sources and one page of web-based items and a short, but adequate Index is included. High quality black and white photographs are interspersed throughout the text. This is a most valuable acquisition for the military history section of any library. The pictures are fantastic... I can recommend it to those who were there or those who have an interest in the British Army of the Rhine. The son and brother of soldiers who saw service in BAOR, and a pupil of King's School Gutersloh in the 1960's, the author provides a fascinating summary of the Cold War, the |Iron Curtain, Berlin Wall and the general role, deployment and activities of the BAOR. There is a considerable amount of detail included although none is referenced which rather undermines the value of the book to the serious student, nevertheless, for those who served in BAOR or Berlin this little book will rekindle many memories of service life in Germany at work, rest and play. The Rhine Army ought to be a topic of interest to historians, political scientists, and sociologists, who will find Paul Chrystal has provided an invaluable guide for their journeys. He outlines the strategic environment within which the Rhine Army operated and describes the alterations and adaptations that were made to the army’s organisation, equipment, and tactics as that environment changed. Case studies examine issues such as post-war reconstruction and denazification as well as relations between the British military and German communities, while the final chapter of the book describes the social infrastructure and facilities which gave service families a sense of community and well-being. Paul Chrystal was educated at the Universities of Hull and Southampton where he took degrees in Classics. He has worked in medical publishing for thirty-five years, but now combines this with writing features for national newspapers, as well as advising visitor attractions such as the National Trust’s ‘Goddards’, the home of Noel Terry, and ‘York’s Sweet Success’. He appears regularly on BBC local radio and on the BBC World Service. He is the author of fifty or so books on a wide range of subjects, including histories of Middlesbrough, Hartlepool, York and other northern places, social histories of tea and of chocolate; a history of confectionery in Yorkshire and various aspects of classical literature and history. He is married with three grown up children, and lives in York.